I was invited to testify about housing supply at the inaugural meeting of the Senate Committee on Housing. I was joined by Mike Kingsella, Executive Director of Up For Growth. Combined, the two of us covered the low levels of new construction, housing supply constraints, affordability being a statewide problem, and one reason our office cares so much is the risk that affordability may potentially choke off migration flows, lowering our longer-run forecasts for, well, everything. In the ensuing discussion, Senator Golden asked a number of questions in which I should have done a better job articulating my answer and our office’s research. This post helps clarify and expand upon those questions. We know new construction in Oregon remains at relatively low levels when compared with the past. However, what truly matters is the balance between supply and demand. Taking into account population increases, and household formation is the correct way to gauge whether or not an imbalance exists, not just looking at total housing starts by themselves. The problem that arises is how best do you measure housing demand? Household formation is ideal, but it is endogenous, or jointly determined with supply and affordability. If we had more housing supply and prices were lower, then we would see stronger household formation because more people could live on their own, etc. As a rough estimate, one can look at the number of new housing permits issued per 100 new residents. Oregon’s modern history is shown in the chart below. I have also included new permits per the growth in the adult population which may be a better proxy for housing demand. 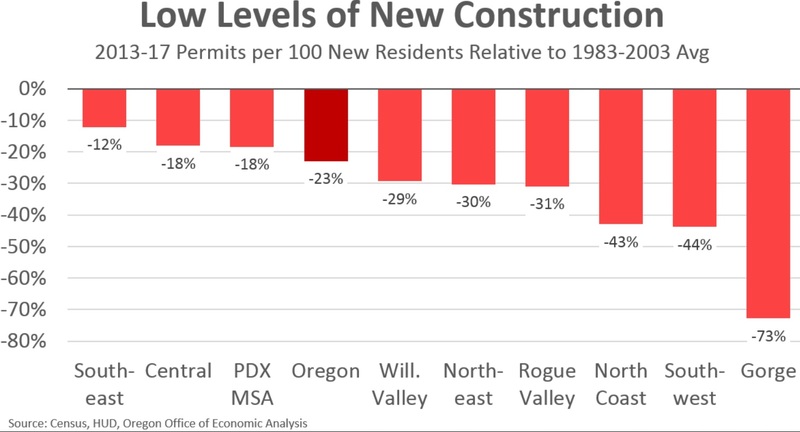 Either way, Oregon continues to see very low levels of new construction since the housing bust. Yes, new construction overall is up, but so too is population growth and migration flows. 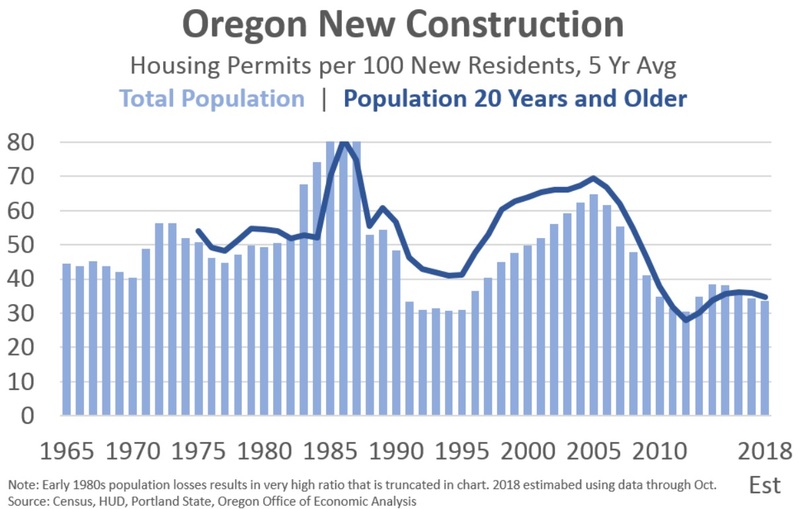 Oregon remains near historic lows for new construction on a population-adjusted basis. At the regional level we see similar patterns. All regions of Oregon today are construction fewer units on a population-adjusted basis than in the two decades prior to the housing bubble. Note: 2018 data is not complete and not available for all counties yet, in part due to the Federal shutdown that delayed data releases. That said, statewide 2018 permits were down relative to 2017. One more year of data isn’t saving us. Turning the above into a direct analog to the permit chart used yesterday shows the drop in new construction relative to population growth in percentage terms. Some regions look better here than in the older chart. For instance, Senator Golden’s Rogue Valley is down 50% in absolute terms but is down “just” 31% on a population growth adjusted basis. 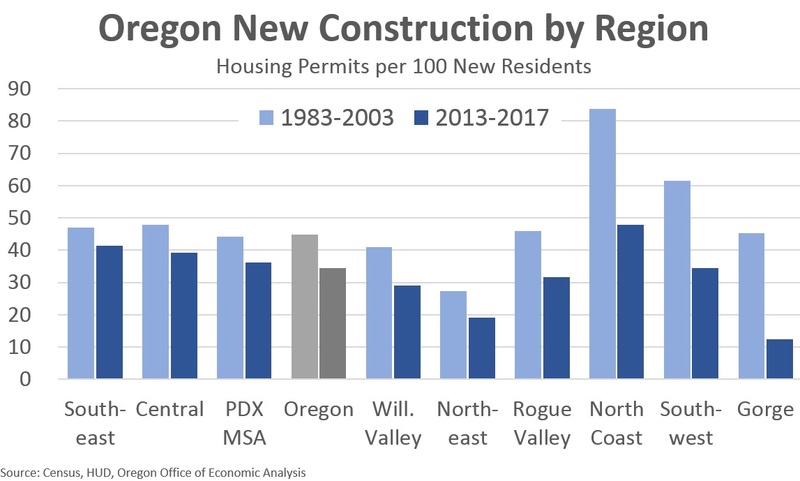 Conversely the Columbia Gorge is issuing a third fewer permits in recent years, but population growth has surged and on a population-adjusted basis they are seeing 70% less new construction. Finally, the potential issue of differences seen in the Portland area versus the rest of the state was raised. This is the part I stumbled all over myself, but did manage a correct but incomplete answer. First, as seen above, the low levels of new construction truly is a statewide (and region-wide) problem. Portland is building more units today than 20 years ago, but not on a population-adjusted basis. That said, we are seeing diverging trends lately in Portland versus the other markets in the state I have looked at. We know the Portland housing market is rebalancing. The increase in new multifamily construction is now slowing rents across all price points, and Mike testified yesterday. And for sale inventory is rising and home prices slowing. However, none of this appears to be happening elsewhere in the state. At least as far as I can tell (email me). In Bend, Eugene, and Salem, for instance we are not seeing an increase in inventory, or time on market, and price appreciation remains in the high single digits over the past year. Furthermore, the increase in multifamily is nearly entirely confined to the Portland region. Multifamily activity in the rest of the state remains 30% lower than two decades. Bottom Line: The housing supply and affordability challenges truly are statewide issues. The increase in new construction activity in recent years has barely kept pace with the increase in population growth. A market imbalance remains. That said Portland is rebalancing and the supply of new apartments is beginning to hold down rents. However these trends are not yet seen elsewhere in the state. Over the next couple of years, with a little more new construction, and slowing population gains, such trends should become evident in other markets, but we are not quite there yet.